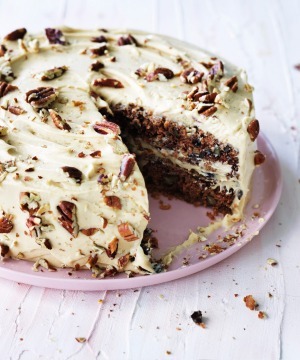 This is a more decadent version of the cake in my book Sweet (co-written with Yotam Ottolenghi). I've swapped the neutral oil for the nutty flavour of browned butter and turned it into a layer cake slathered with a caramelised chocolate cream. 1. Preheat oven to 200C (180C fan-forced) and grease and line two 23cm round cake tins. 2. Brown the butter by placing in a saucepan over medium heat. Once melted, continue to cook until the butter is foaming. Swirl the pan gently until you see dark brown sediments begin to form on the sides and bottom of the pan. Let it bubble away until it turns a rich golden brown. Remove from heat and allow the burnt solids to collect at the bottom of the pan, then strain through a fine sieve, discarding the solids. You need 280ml of browned butter. Any excess can be kept for another use. 3. Using an electric mixer with the whisk attachment, beat the eggs and sugar on high speed for 2 minutes, until thick and creamy. Reduce the speed and add the browned butter in a steady stream. Sift the flour, cinnamon, baking powder, baking soda, nutmeg, aniseed powder and salt together in a bowl and add to the mixer on low speed. 4. Fold in the parsnip, 150g pecans (use the rest to garnish the cake), currants and orange zest. 5. Divide the mixture evenly between the two lined tins and bake for about 40 minutes, or until a skewer inserted into the centre comes out clean. Remove from oven and cool completely before assembling with icing. 6. For the icing, place the chocolate in a bowl set over a pot of simmering water. Stir gently until melted, then remove from heat and set aside to cool slightly. 7. Place butter in the bowl of the cake mixer and beat with paddle attachment until smooth, then add the cream cheese. Combine, then add the melted chocolate. Beat until smooth, then add the cream and maple extract and beat until soft waves form. 8. When ready to assemble, place one cake on a serving plate, flat side up. Spread a third of the icing evenly on top, then place the second cake on top of that, flat side down. Spread the top with another third of icing, then cover the sides of the cake evenly with the remaining icing. Finely chop the reserved pecans, and sprinkle around the edge of the cake.